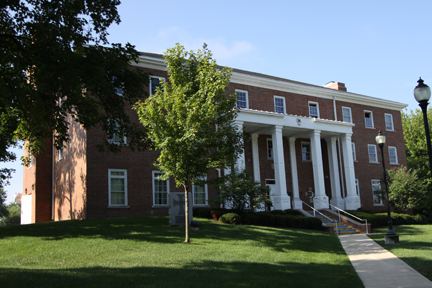 This is the Sigma Chi house at Wabash College. It is the setting of one story—codenamed “The Wabash Men”—in my upcoming collection of short stories (written for my MFA thesis). It will be published in May 2013 in a limited edition print run as well as the e-book form. I just realized that one of the short stories I’m writing for my MFA thesis actually takes place at Wabash College, which is where I went to undergrad. Isn’t it weird how these things can sneak up on you? Suddenly something just snaps into place in your brain, and the story starts to come together in new ways. It’s exhilarating. I knew the story was set in the same town, and that it even spent some time on campus at one point, but I didn’t realize until now that the entire story should be set there. I’m excited to get through the next draft. The situation and concepts the story is dealing with are incredibly organic to essence of the college, which is an all-male institution (that’s a hint at what’s to come). I don’t know how I didn’t think of this sooner. I’m both proud and afraid to be writing about my alma mater. I think the title might even be “The Wabash Men,” which is perfect, especially if you know anything about Wabash culture and the Gentleman’s Rule. Stay tuned for more in the coming months. This all culminates in the release of my short story collection in early May 2013. UPDATE: Okay, so I didn’t end up calling the story “The Wabash Men.” Nor is it explicitly about Wabash. But it’s location is very Wabashesque. Sometimes in the writing process, you realize that things have to change; the story you are writing isn’t the story you thought you were writing. ← New Web Design Coming!